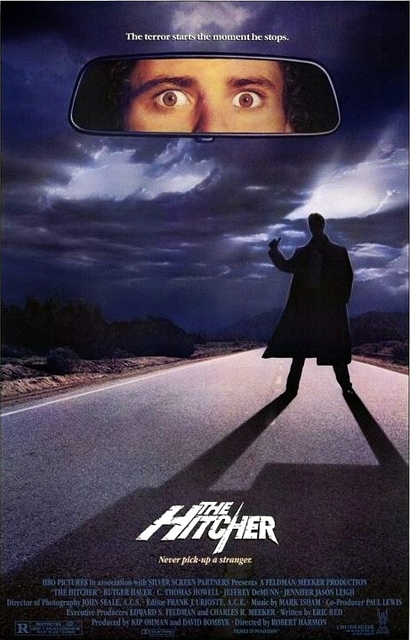 A young man escapes the clutches of a murderous hitch-hiker and is then subsequently stalked and has his life made into hell by the same man he escaped. In past posts I've stated how there is a very fine line between the Horror and Thriller genres, this 80's classic is a great example of a film that is sat right in the middle of the two and manages to embrace both elements perfectly. This film is also a perfect example of how to keep the viewers attention, with the tension raising as the film goes on you find yourself glued to the screen as you edge closer to the edge of your seat. Kudos to Writer Eric Red for an excellent story and kudos to Director Robert Harmon for making the story come to life on screen. C. Thomas Howell who plays our victim, "Jim Halsey", is absolutely fantastic. His character is someone you warm to and really feel for when his life gets turned upside down in such a short space of time. Jennifer Jason Leigh's character "Nash" is well acted but her role seems somewhat of a fill in and you don't feel the same for her as she chose to be in that position, unlike "Jim Halsey" who was just very unlucky. The star of the film is undoubtedly Rutger Hauer, he plays the character "John Ryder" flawlessly. He seems to embrace the psychotic role and you get the sense he had so much fun doing the film, he becomes one of those sadistic characters that you find yourself enjoying to watch and feel a little guilty for enjoying each menacing scenario he creates. There was a remake of the film made in 2007 with Sean Bean, if you enjoy this film then I suggest you don't bother with it. The original version of the film is so much better and the remake doesn't really bring anything new to it, it's really just an un-necessary updated version of the original, a bit like Gus Van Sant's version of "Psycho". This film shows you how tensity is done and if you love a thrill ride of a film then I highly recommend this, I'm sure you won't be disappointed. Phantasm V: Will It Ever Happen?